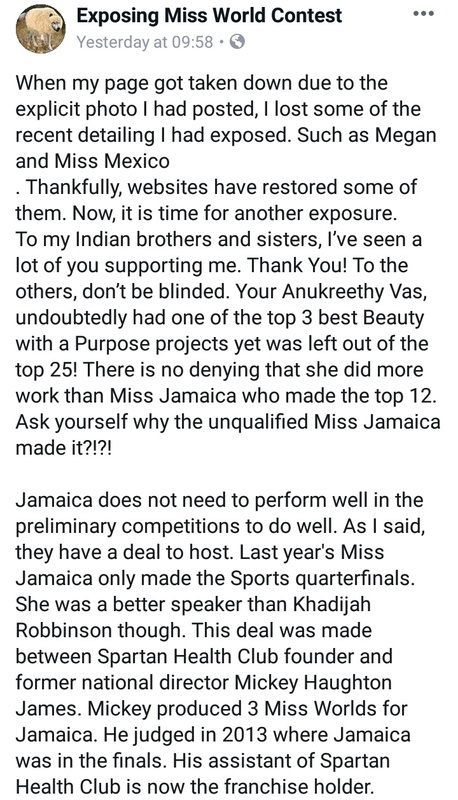 The anonymous author of Exposing Miss World page have many interesting tidbits to share. Stay tuned for more updates. The days of empire are long gone. Sadly, at this time and age, some of the manipulative machinations prevailing in Mess World still carry with it the yoke of tyranny in "master versus slave" infamy, if you get the dichotomy of what I mean! Last edited by beautywatchnyc on Sun Jan 27, 2019 5:32 am, edited 1 time in total. MORE MORE MORE. CANT WAIT FOR HIM OR HER TO TALK ABOUT RUFFA AND EVANGELINE. Miss World really is NASTY isn’t it? It’s like MGI on a grander scale. Still a cooking show nonetheless. I hope countries will WAKE UP and realize that MWO is not pure with their advocacies. It is a business that sells fake advocacies. They need to make their organization look like they are in charity related works but in reality they need to help because they need to make sure their business earn. THAT EXPLAINS WHY THE QUALITY OF DELEGATES BEING SENT IS DOWNGRADING. Where's The Critic ? She should post here and defend her favorite pageant..
Rather than bask in the implacable absurdity of defiance and denial, The Critic opted for obscured silence. The ignominy of defeat is indefensible. Last edited by beautywatchnyc on Mon Jan 28, 2019 7:47 am, edited 2 times in total. Is Miss World still a thing? 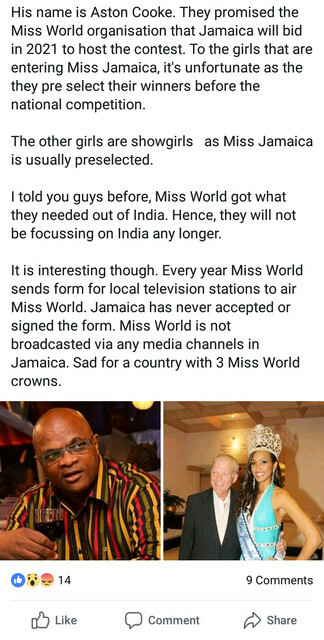 PLACING IN MISS WORLD IS NEVER HARD FOR JAMAICA. Miss World is very sad and very poor. And I dont see any silver linings! jhunz23 wrote: Miss World is very sad and very poor. Silver Lining's on that Goddamn stage design every year. I will defend Miss World . First and foremost , so many gorgeous women compete there . It does not even matter whether it’s a cooking show or not ... people want to see beautiful girls . Period. 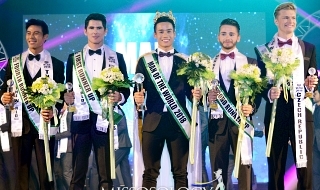 Mister World too is a significant pageant kasi maraming tite . 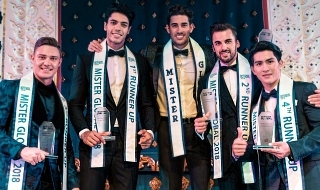 It’s the premiere male pageant in the world . Galunggong wrote: I will defend Miss World . Yeah... That's why it is staged every 2 years and even being postponed several times. Kulang lang sa budget si Aling Julia at kulang sa marketing ang Mister World . In short ..hindi mabenta but nevertheless it’s still the numero unong male pageant in the world . It’s a pageant that people love to hate . People are talking about it .... that’s what matters . Good or bad publicity is still publicity . And besides ... it’s the oldest pageant in the world . But more that anything it’s quality and caliber of girls that makes Miss World significant . One pageant is not enough . Miss Universe pageant is not enough . The world needs Miss World pageant . Galunggong wrote: The reality is .. YOUR COOKING MESS WORLD???? IT'S POOR AND VERY SAD AND ADDTION IT'S BORING. May pera sa basura . Kumikita si Vegafria sa MW Philippines. At maraming pang bansa ang kumikita sa pakontes na yan ni Aling Julia . Hindi lang talaga si muning ang napipisil ni Aling Hulya at that time . Even Katarina Rodriguez.. hindi sya ang napipisil . Pero it’s not enough para kasuklaman ang MW. Ang daming bansa ang nagpapadala ng candidates sa pakontes nayan year after year . Tsaka Miss World yan ‘no ....there’s a certain ring to the title ... namnamin nyo ..kung ikaw ang tawaging Miss World .. bongga di ba ? Miss Universe at Miss World. Dahil sa caliber and quality of the contestants . Andya dyan ang mga diosa . Tapos aawayin nyo pa ang Miss World . Mag hunus dili kayo mga bakla . Kalamayin nyo ang mga sarili nyo. Ngayon pa ba magku quit ang Pilipinas sa pakontes nayan ? Kung kelan beauty pageant powerhouse na ang Philippines ? The thing with Aling Hulya ... kung talagang beauteous like Megan Young , she cannot deny her the crown . Galunggong wrote: Ngayon pa ba magku quit ang Pilipinas sa pakontes nayan ? While i agree na wag muna tayo mag quit sa MW, i disagree na catriona can win in that edition. MW is all politics. Even megan’s win is political (though acceptable by many because megan is really a strong candidate). Julia didn’t gain anything from megan’s win then seeing how easily Miss Universe managed to make a hosting deal with PH. With these there’s no sense in crowning another filipina that fast. 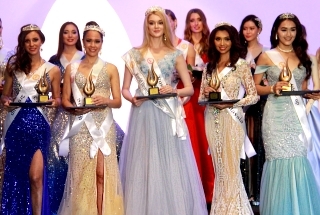 Megan's win DID uplift Miss World in the Philippines though. After her win, Miss World's likes was actually number 1 for several months mostly coming from Filipinos. At that time, people were in love with Julia and praising her about how motherly she was to Megan! and then Catriona lost and we were back to calling it a cooking show. Sapphire wrote: Megan's win DID uplift Miss World in the Philippines though. After her win, Miss World's likes was actually number 1 for several months mostly coming from Filipinos. At that time, people were in love with Julia and praising her about how motherly she was to Megan! and then Catriona lost and we were back to calling it a cooking show. After the Cooking Show debacles with Evangeline Pascual and Ruffa Gutierrez, Filipinos gave the scam pageant another chance when it rightfully crowned the unquestionably strong and universally beautiful front runner Megan Young. And Filipinos, as an act of support, were still pushing for a possible MW Philippine hosting in the future despite the 2014 hosting talks failure. But the new debacle with Catriona Gray engendered a reaction that even Morley didn’t expect. Morley would be so stupid to believe that she could get away with her schemes forever. But Filipinos would be more stupid to keep sending representatives to this scam pageant after having already been screwed over and over. Look who is talking about "suspicious" pageant. I can't.